Treat your feet to the comfort of cushioning. Great for your feet, easy on your wallet! Unique tapered toe design won't compromise the fit of your shoes. The standard of affordable and effective insoles. 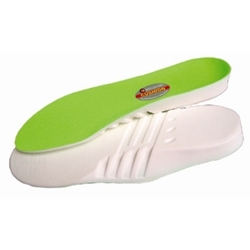 Cushion Insoles promote air circulation and the long lasting nylon top keeps your feet cool and dry.